I started blogging in December of 2013. I was just about to graduate from college with my degree in Fashion Merchandising, and I desperately wanted to find a way to break into the fashion industry in San Diego. With limited options, I decided it would be fun to start doing my own thing, which led me to creating Polka Dots & Sailor Stripes. It started as my fashion outlet; a place to put my daily outfits, inspirations, and some fun personal pieces of myself. It has grown into something that I am truly proud of, and I look forward to the opportunities that may come from it! Clothes. Honestly. I know that is such a cliche answer for a fashion blogger, but there is nothing that inspires me more than clothes. The possibilities are so endless; you can create any type of mood you want to simply by piecing together the right outfit. I love that I can in turn inspire people with my ideas through my blog. Kate Spade is also a huge huge inspiration in my life, love that woman and all her fabulousity. In my spare time I try to stay creative. Constantly looking at other blogs, online shopping to do trend research, and perusing my magazines to see what's happening in the world of fashion. I also tend to shop a bit too much when I have spare time...it gets me in trouble. What’s your favorite quote or life motto? I am a really big "quote" person. They can be so invigorating, and really all you need to hear to be motivated sometimes. I think right now I would have to say that the simplest, most inspiring quote to me is "She thought she could, so she did." I am a huge dreamer; I daydream all the time about things I'd like to accomplish. I believe that if we have the ability to dream it and visualize ourselves doing it, then we have the ability to make that vision come to life. If you think you can, then do it. You have nothing to lose! I have lived here for about 4 years. I hadn't been down to San Diego very much before deciding it was where I wanted to attend school, but the few trips I did make were all it took to convince me that it was a brilliant city. I love that I can get a little bit of everything that I need in my life; the beach, the city, the small town feel, and also the mountains at the cost of a short drive. San Diego has so much to offer, and for a girl who has dreamed of living at the beach since she could remember, but also can't bare the thought of giving up access to a city and some mountains, this place is terrific. I tell everyone that asks me this question, social media is your best friend. I was really shy when I first started my blog, and the thought of putting my pictures out there on Facebook, Instagram, Twitter, Pinterest, etc., terrified me! I thought it would come off as annoying with the constant posts about my blog. It's not true!!! To anyone reading this, networking is NECESSARY. Social media is going to take your blog where you want it to go, and postponing the exposure is only going to hurt you. The blogger world is so small, and it's so easy to make friends. Comment, like, tweet...whatever! Just connect with people as much as possible; it's a must! I love collecting clothes and I love fashion as well. Reading fashion stylists stories make me love fashion even more. 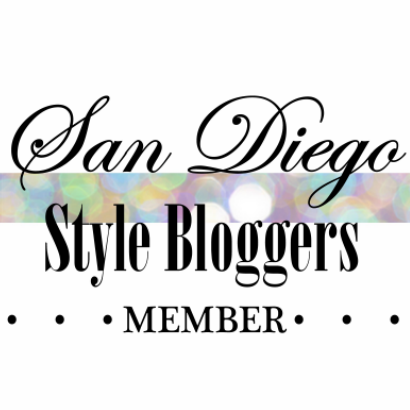 I was just wondering, do you have gatherings where the featured fashion stylists/style bloggers attend? It would be fun.